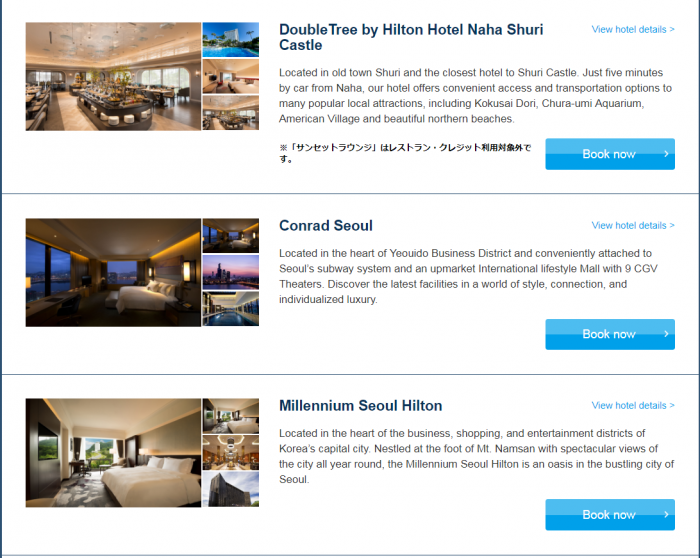 Hilton Honors launched back in mid-May a sale for stays at participating hotels in Japan, Korea and Guam through August 31, 2018 that is about to end. Members can save up to 25% off and get daily F&B credit of $50, 5,000 JPY or 50,000 KRW depending where the stay takes place. The offer is valid for bookings until May 31. Previously, these sales have been up to 50% off and without the dining credit that must be difficult to use for some (not enough to wine and dine). Worthwhile to have a look at the rates offered under this promotion and book if they are good enough and your plans firm. Limited availability at the discounted rates. 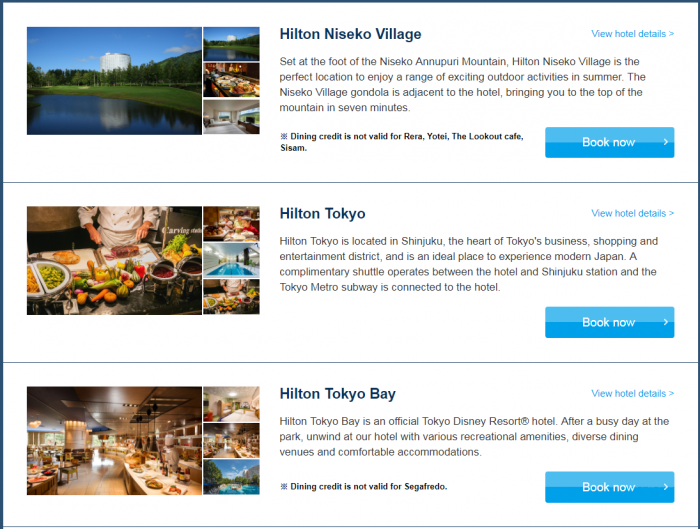 Offer is subject to availability at all participating properties in the Hilton portfolio across Japan, South Korea and Guam for stays booked between 15 May 2018, 2pm JST, and 31 May 2018, 2pm JST, and completed between 15 May 2018 and 31 August 2018. Subject to hotel, offer is valid only for selected premium room types at participating properties and may include Suites, Deluxe and Executive-type rooms. Actual discount rate varies by room-type and property. Blackout dates may apply and vary. Rates are valid for single/double occupancy and are exclusive of all taxes, incidental charges, gratuities, and resort fees where applicable. Discount is up to 20% off Flexible Rate (“BAR”) for selected premium room types across all participating properties. Hilton Honors members will receive an additional 5% off BAR. There will be no meal component exclusion (e.g. Credit may be applied to alcoholic beverages). There will be no refund of the excess credit to apply to another service (e.g. If total dining spend is only JPY4,000 for a 1-night stay in a Japan property, guest will not be refunded the balance JPY$1,000). 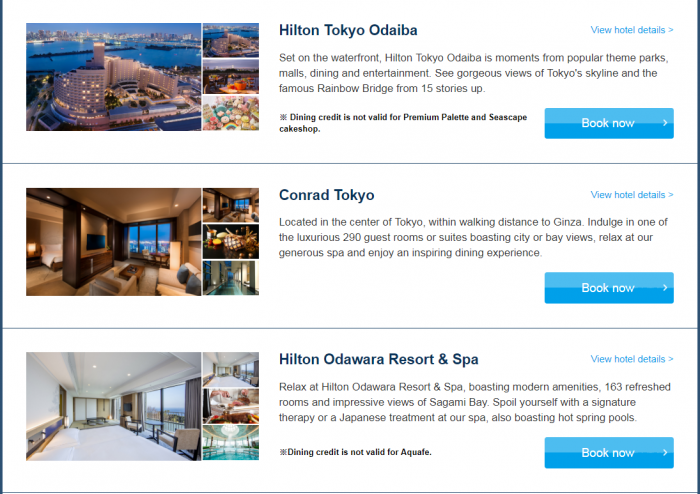 The dining credit may be applied towards dining at on-property restaurants but is not applicable to minibar and room service as well as at the following restaurants: Rera, Youtei, The Lookout café, Sisam at Hilton Niseko Village; Aquafe at Hilton Odawara Resort & Spa; Premium Palette & Seascape Sweets and Coffee at Hilton Tokyo Odaiba; Segafredo at Hilton Tokyo Bay; Java Café Restaurant at Hilton Tokyo Narita Airport; Sunset Lounge at Doubletree by Hilton Naha Shuri Castle; The Lounge at Doubletree by Hilton Okinawa Chatan; and Sweet Corner at Hilton Busan. Kids up to 12 years at time of stay eat for free (breakfast only) each time with an accompanying paying adult. BAR is a specific rate type that vary depending on time of purchase, is unrestricted, non-qualified and excludes discount rates. Full non-refundable prepayment required at time of booking. Your credit card will be charged immediately for the total amount quoted for the entire stay as reserved and refunds or credits will not be issued unless otherwise indicated by local law. Charges cannot be applied to other stays, services or merchandise. Booking cannot be changed or cancelled. This offer may not be combined with other select promotions, offer or discounts and is not valid for existing reservations or groups. Offer components are non-transferrable or redeemable for cash, and cannot be used during future stays. “Hilton Honors™ membership, including the earning and redemption of Points, is subject to Hilton Honors Terms and Conditions. All Hampton by Hilton™ hotels in Mainland China are excluded from the Hilton Honors program.